A couple of months ago I went to the auctions with my friend Pete (who I got my perforator from) and came home with what I consider to be a little bargain. It is two volumes of prints of paintings from the collection of Eugène Secrétan, the nineteenth century French industrialist who made his fortune in copper production. Unfortunately for him, his immense fortune did not last and his large collection of paintings , sculptures, furniture and objet d’art were sold at auction to pay off his debts – these books are, in effect, auction catalogues. They are quite big (15⅞ x 11⅜” – 381 x 279mm) and are composed of loose sheets taped into pairs and sewn, covered with a light brown card jacket, folded over the front and back leaves. Essentially unbound, but I have since seen a few copies on the web that have been bound in leather. 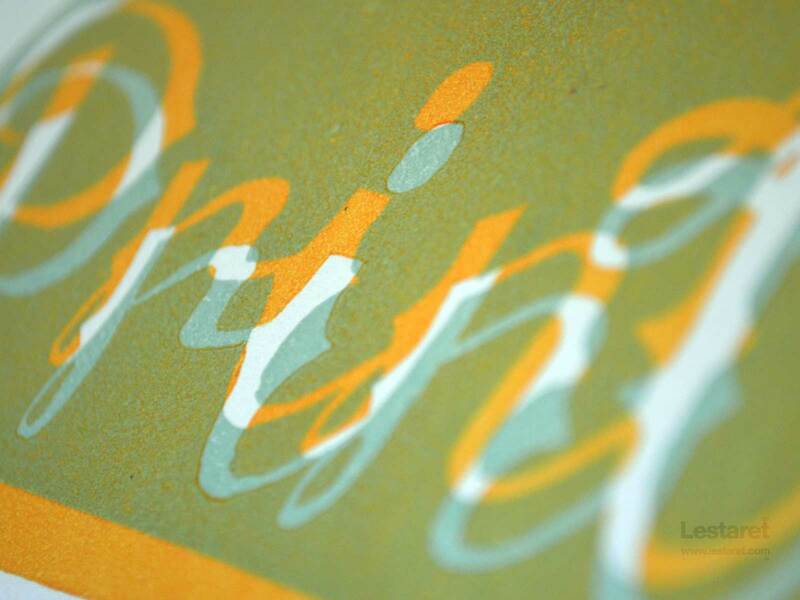 The text is beautifully set in a variety of metal type and letterpressed throughout. The paper is a heavy smooth stock, which I estimate is about 220gsm and has some yellowing and foxing around the edges, as well as a little water damage here and there. The first few text pages are quite heavily printed and wonderfully tactile. I know this will have the purists screaming, but I like it. And followed with a description. The prints are photogravure – hand printed from copper plates (how ironic) that had been coated with light sensitive chemicals and acid etched. This allows for good reproduction of fine detail and subtle continuous tones, perfect for art prints. The majority of the prints clearly show the impression of the plate. There are two volumes in all and they are missing a few prints each, but not many. And the price? £9. Bargain. It’s been a very busy few weeks over here at Lestaret Towers, so last Friday I took off into the beautiful Suffolk countryside with my friend and fellow designer Jodie Cole to go to the Lettering Arts Centre at Snape Maltings for a bit of inspiration. The Centre is home of the Lettering and Commemorative Arts Trust and is currently host to an exhibition of the work of the legendary letterpress artist and designer, Alan Kitching. The exhibition included a selection of his work spanning his career that followed his unexpected departure in 1988 from his role at Omnific Studio Partnership with Derek Birdsall and Martin Lee where he had set up a letterpress studio in 1976. There are of course some familiar images included in the exhibition; the broadsides and typographic maps especially, which are even more spectacular in the flesh due to their scale – about A1 size! As well as the more recognisable prints from his archive, there were also a number of little gems – mockups and markups and the like, as well a little pile of ‘make-readies’ – offcuts of paper and card used to slip under worn type to raise the surface to type height. These are little things that will be hugely familiar to anyone has experienced letterpress printing, and it is comforting to see the evidence of this wonderfully low tech and time-proven method. Jodie was as impressed as I was, and I had seen many of these prints a few years ago at an exhibition in London, but there were prints here I had not seen, as well as items from his own archive. I had also booked us a couple of places at a talk by the man himself in the evening, and we took our seats amongst a small number of others in the exhibition space itself, which made for a very intimate experience! Kitching was interviewed and prompted to discuss all kinds of issues and subjects, where he gave very personal and honest responses as well as answering questions. He also hung around afterwards to chat with people, and Jodie collared him for a photo. Fangirl! The exhibition is to promote a new Monograph by John L. Walters (Laurence King) published next year. There were some copies for sale at the event so I had to indulge myself! Good times. Many thanks to the Lettering and Commemorative Arts Trust for putting on such a great exhibition, and also to the man himself, for being so gregarious and not anything like the unapproachable grump I had mistakenly understood him to be! Many thanks to all of you who commented here – it’s nice to know that I am not the only one with odd habits! As I said in the post, I only have two of these to give away and feel bad about disappointing people, so I will be sending something printy to everyone! Everyone has been emailed – just let me know when you get your pack! Thankyou to everyone who joined in, especially Phoebe and Justin who will receive one of these prints (and a few other bits) in their mail soon! I have a very inviting pile of nicely printed postcards that are demanding to be overprinted. Again, I am experimenting with some new colours (for me) and aiming for a grungy/retro feel on each of the cards. I had printed a number of additional cards to use as set-ups as there is nothing definite when it comes to printing, and every stage has an opportunity for something to go awry. But after a few prints, the block settles down and I start to get the results I’m after. This is quite a rich orange, but because of the transparent extender, it looks metallic, almost gold on the block! This image has been my wallpaper ever since! This was about 98% extender and 2% black! I couldn’t get the transparency I wanted so I under inked the block instead. If anyone else would like to enjoy some printy wallpaper, you can down load it here. The unseasonally warm start to spring (although it has been followed by some fairly sharp ‘brass monkey’ weather) seems to have got my dander up in the printshop! I added just a little more yellow to push this towards a pale turquoise. I am very pleased with this colour – it has covered well and laid down a rich base for the next stage. Oh, I had cut these blocks to try to develop my cutting skills. Sorry, no images of that part. The next coulour was a soft pink, again using a base of the white with a dab of magenta. I did want these prints to be clean – free from the lino ‘peaks’ – but thought these added something to the effect. I kept making small adjustments to the block to keep these to a minimum though. The next block was printed in a baby peach colour, made from white, yellow and magenta. This one has printed very clean and sharp as I intended. There is also a fourth block, but I’ll save something for the end! With 40 cards all printed and stacked in my drying rack, I’ll let you know what is to come next; transparent colours. The Lestaret Corporation has recently been granted a franchise on one of the divisions of Hell and as of May 2012 will be issuing tickets for the new system of entry (for a small administrative fee, of course.) This will involve standing in lots of queues, and the continual listenening to the entire output of Justin Bieber. Not big changes then. 1. Taking reference from a classic format, all measurements were accurately taken. 2. A batch of sturdy card was trimmed to an oversized dimension (10mm all round,) for better handling during printing. 3. A template was created in order to gain an accurate position of the print. The centre was trimmed to show the maximum print area and used to overlay the makeready prints. 4. Printing. Well, not quite that simple. First the type needs composing – Univers 45 and 68 centrally aligned – this took around 45 minutes in all, particularly in the positioning of the type in the chase. This was then printed on the Adana 5/3 in a dark green. A day later, the numbering box was installed and the tickets were sequentially numbered in a deep red. 5. The top and bottom are then trimmed. I set up a temporary jig on my cutting mat to speed this up. 6. The tickets were then perforated using a small perforating wheel bought from a local craft store. Again, a temporary jig was used for this process. 7. Holes were punched with a hand held single hole puncher, using a cardboard jig to ensure consistency of position. 8. Edges removed to enhance the reveal the ticket! This is a lot of effort for such a small bit of ‘stuff’ but I like it!